When I was a kid, lo these many moons ago, a bike light was to a kid what fog lights were to our parents' cars; a delicious add-on. We all wanted a shiny new bell or handle bar streamers so the other kids on the block would ooh and aah over our latest acquisition. Today, as I watch the kids riding up and down the sidewalk in front of the house, these bicycle accessories are not often seen. Still, someone must be buying them, because hardware stores and dollar stores alike, still stock them. Cable locks with key -- Unfortunately, a bike lock is pretty much a necessity in most neighborhoods. The dollar store version is vinyl-coated and 27 inches long, an adequate size for a kid's bike. It costs $1.25. The hardware store cable lock is similar but is 6 feet long and costs $14.99. Neither one of these is going to stand up to a determined crook with a good set of cable cutters but they will keep an opportunistic thief from swiping your kid's bike from where he parked it outside the video store. Mirrors -- We all had a "rear view" mirror, not that we ever really made use of them; it was just a cool thing to have perched on the handle bar. Today's bike mirrors are adjustable, like a goose neck lamp. The hardware store mirror, very much like its dollar store counterpart, costs $7.99. Save your money and pick one up for a buck at the dollar store. Lights -- Yesteryear's parents didn't let their kids out after dark, never mind on two wheels, so a bicycle light was not a necessity. Nevertheless, it was considered a cool addition to our bikes. A bike light could be the difference between being seen by a car or the unfortunate alternative. Keep your kids safe after dark for a song. 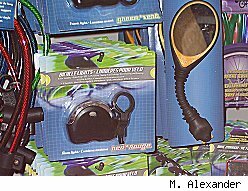 Dollar stores have bicycle lights featuring two modes, flashing and steady, and come in a package containing one white and one red light for $1.50. The three LED batteries required for each light are not included. At the hardware store, you have to buy front and back lights separately and they cost $7.99 and $8.99 respectively. These lights require two AA batteries each, not included. Horns and bells -- What kid doesn't like things that make noise? Satisfy that urge with either a bicycle horn or a bell for only $1 each. At the hardware store, a horn for a kid's bike will set you back $4.99 and a bell costs $3.99 and up. If you want a bell emblazoned with a favorite cartoon character like Power Rangers, you'll have to shell out $7.99. Repair kits - I didn't see any of these in the bicycle section at the hardware store, which I thought was odd, but the dollar store has repair kits that include multi-purpose wrenches, glue and rubber patches for $1.25. You always hope you won't need one of these anyway but, like a first aid kit, it's always good to have on hand.